49 & 51 Kingston Ave.
We are excited to announce our Spring Edition of Slaburday being held Saturday May 27th from 12-4PM at the Urbn Timber Shop. Come on out and meet the Urbn Timber crew along with local Columbus makers before you head to the neighbor's BBQ! Our walls are lined with inventory of Ash, Cherry, Maple, Sycamore and Walnut awaiting the perfect home. Come browse our collections to find the unique piece you've been looking for. Other Urbn Timber merchandise including t-shirts, coasters, turning blanks and candles will also be available for purchase. Small bites & refreshments will be provided. The Urbn Timber team is excited to meet you and your friends at our Spring Edition of Slaburday! These past 3 months, Treg Sherman and Tyler Hillyard have been traveling the Midwest, Eastern & Southern United States promoting Arbortech at The Woodworking Shows series. Arbortech is an Australian born company, with US headquarters based in Boston, MA. They specialize in woodworking and masonry cutting power tools. Our favorite tool from Arbortech is the TURBOPlane, a 4" wheel for your angle grinder designed to plane and shape wood. We recently used the TURBOPlane on the Sherman and Chaney Projects to shape corners and but ends into the live edges. We've enjoyed meeting new people in the Woodworking industry, traveling to new places and eating the local grub - but we're ready to be back at The Urbn Timber Shop. Exciting things are happening - stay tuned for more! The Sherman Table is made from an Ash Tree that was taken down due to damage caused by Emerald Ash Borer. 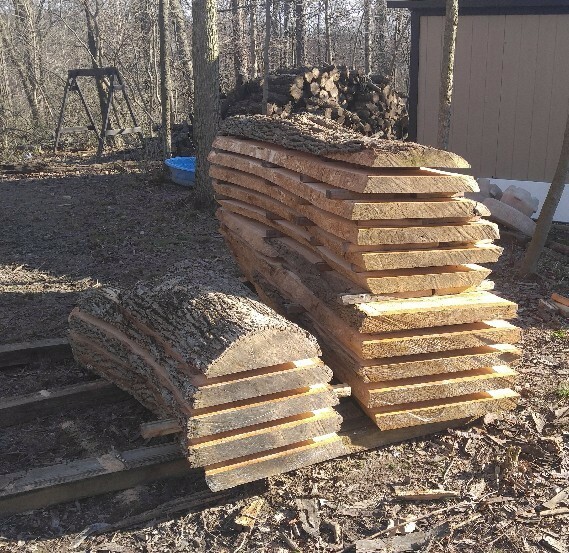 This tree was milled in January 2016 in Sidney, Ohio, air and kiln dried and was then moved to the Urbn Timber Shop to create, shape and finish the table. The main section is 3.5'W x 7'L with 2 removable leaves for a total length of 10'. Each leaf is 3.5'W x 1.5'L. The table can accommodate 12 people comfortably. The rustic farm style was created by dropping chains, pipes and hammers before finishing with Rubiomonocoat to pull it all together. The custom steel trestle base was hand welded by Josh Wilford with accents of shaped metal wraps. The pictures shown below show the tree to table process. 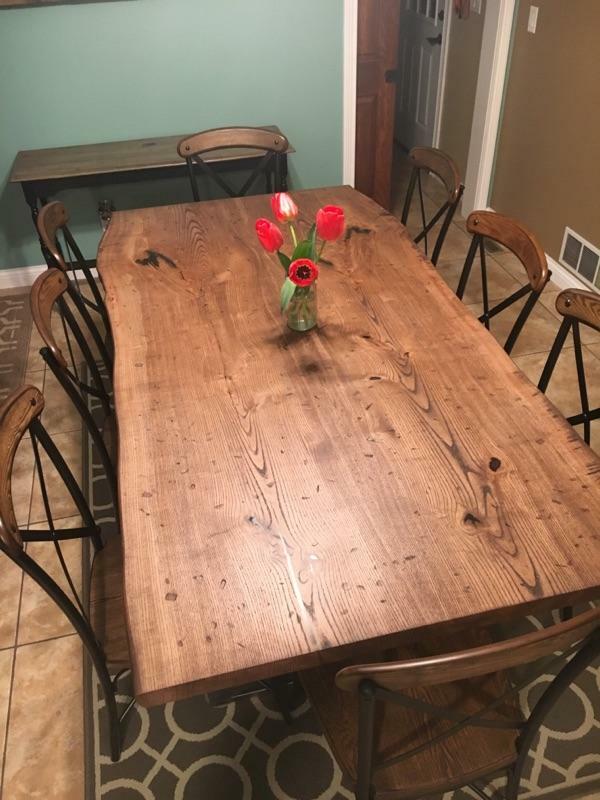 This table was delivered this past Sunday to Scott and Kristy Sherman in Sidney, Ohio.